Care for your ultra sensitive skin with the La Roche-Posay Toleriane Softening Foaming Gel, an effective cleanser created especially for those with intolerant skin. Rich yet gentle, the foam does not disturb the delicate balance of reactive skin. It is enriched in hard water-neutralising EDTA, so it can be used even by those whose skin reacts to water. The finely balanced formula is made precisely to minimise the risk of intolerance, and is soap free, preservative-free and fragrance-free. Glycerine moisturises the skin and leaves it feeling supple and protected from external aggressions. 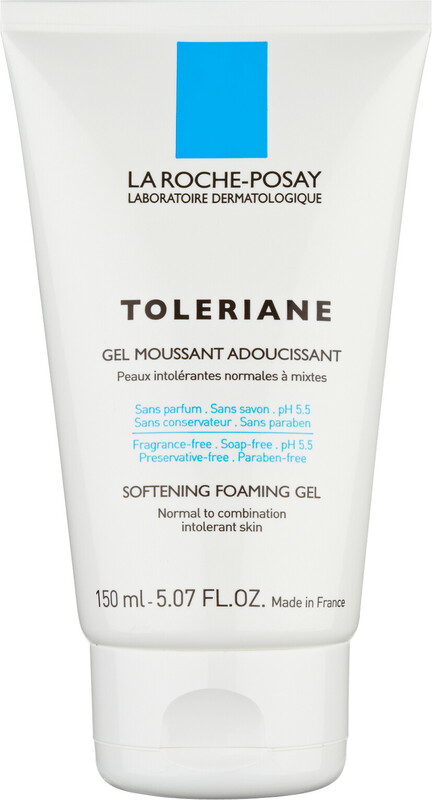 Presented in a rich yet gentle gel format, the Toleriane Softening Foaming Gel transforms into a soft foam upon contact with water. Work the La Roche-Posay Toleriane Softening Foaming Gel into a foam in the hand with warm water both morning and night, and massage gently into the face avoiding the eye area. Rinse away thoroughly. La Roche-Posay Toleriane Softening Foaming Gel 150ml is rated 5.0 out of 5 by 3. Rated 5 out of 5 by VonTiki from Fantastic Cleanser After a lot of reading on /r/skincareaddiction and learning about PH and moisture barriers I came to the conclusion that there was a high likelihood of my skin being highly dehydrated as opposed to oily. After a week of using this cleanser, it turns out to be true. Neutral smell, doesn't sting at all in the eyes or nostrils, and a thick-ish white creamy gel, I only need a small pea size amount per use, so this is going to last months too! I would say that this isn't easy to foam on this skin at all though, and I prefer using it that way honestly, wet the face and squeeze a tiny amount on the back of my hand, dot all over, then massage in. I did try the Japanese method of foaming by using something like the DHC Bubble Foaming Mesh, which worked fantastically well, but I somehow keep inhaling the bubbles.Good news is that it doesn't sting at all in the eyes or nostrils. After using the Toleriane cleanser my serums and moisturizer seems to sink in a lot quicker too. My skin feels so much healthier after using this, I'd previously been using Neutrogena grapefruit scrub and Hada Labo AHA BHA Foaming Wash and I didn't realise how tight my face felt until using Toleriane. So happy I tried it! Rated 5 out of 5 by Bean from Simple & Effective A simple and very effective face wash. It doesn't foam which is the most important part! Foaming products irritate and dry my face out. Great for my ultra sensitive skin and a perfect morning cleanser. I only really use a large pea size amount and it lasts quite a while so I'm able to justify the price. Rated 5 out of 5 by Tam2013 from Gentle and effective This cleanser is very mild, gently foaming and only a small amount is needed so it lasts for a long time. I use the Toleriane dermo cleanser in the evening to remove make-up & this in the shower in the morning - both work well for my sensitive, combination skin.